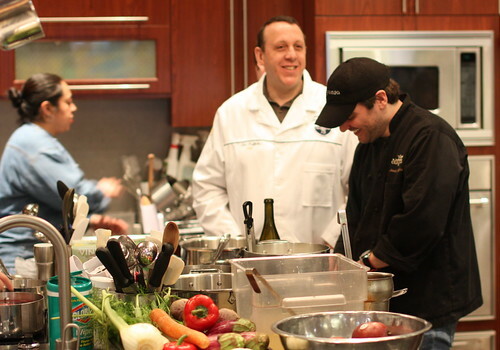 It’s time again for another episode of Ultimate Chef Bergen County! 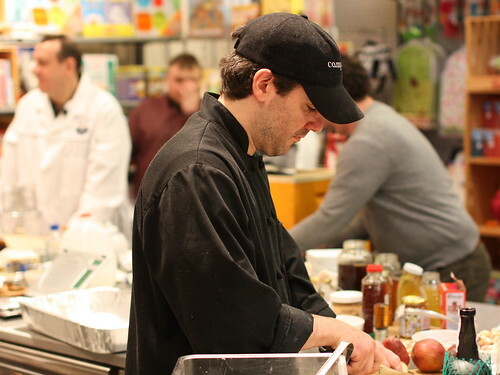 After defeating Chef Joe Macri from Northvale’s Hennessy Tavern in the Ultimate Chef Bergen County finals at Chef Central in Paramus last month, on Saturday, February 28, 2009, Chef Christine Nunn of Picnic Caterers in Emerson went up against last year’s champion, Joe Cerniglia of Campania Restaurant in Fair Lawn, for the final bout and to compete for this year’s title and bragging rights of Ultimate Chef Bergen County. 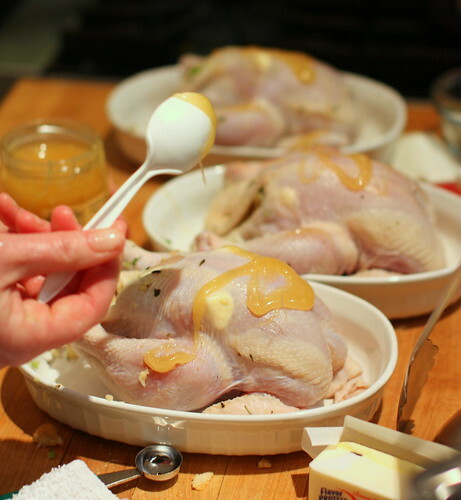 This year’s “Secret Ingredient” was HONEY. Ready for a sticky sweet smackdown, Jersey Style? Click on the “Read the rest of this entry” link below for more. 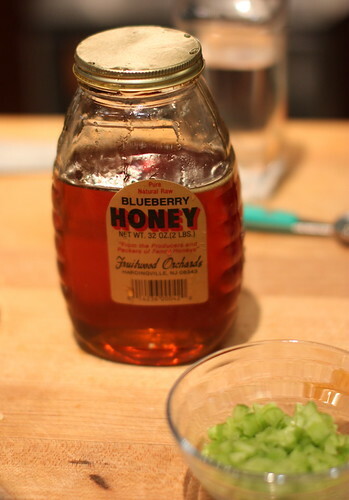 This is a blueberry honey from South Jersey. 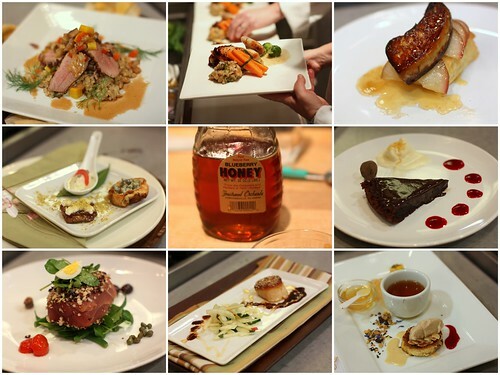 Both teams brought along various different honeys to use as focus flavors for each dish and to build on the unique flavor characteristics of each honey. 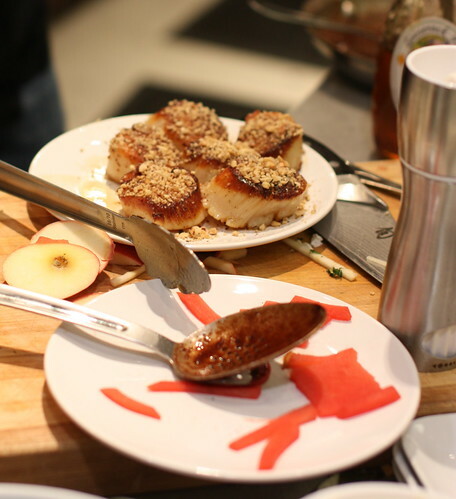 Picnic Caterers focused exclusively on New Jersey/New York area honeys, whereas Campania had honeys from all around the US including Orange Blossom honeys. Honeys from New Jersey are difficult to find during the winter months as they are an agricultural product and mostly sold during the summer at Farmers Markets and Fruit/Vegetable stands when summer produce is available. Still, Picnic was able to collect a bunch of interesting ones from local farms. 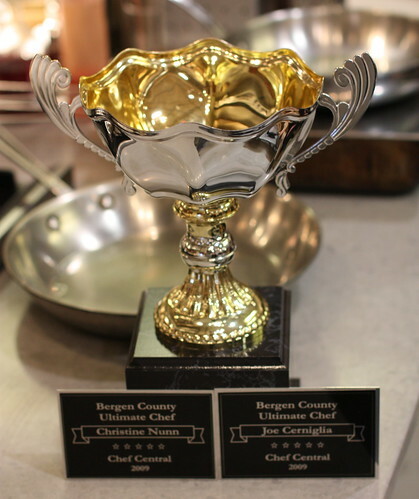 The coveted Ultimate Chef Bergen County Trophy. Two competitors, but only one will win. 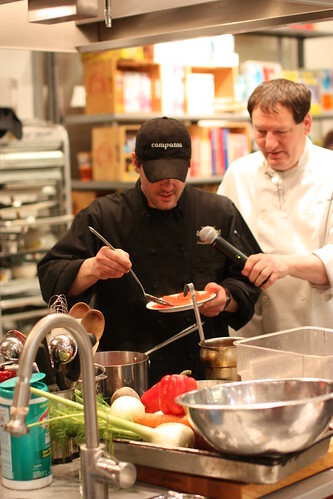 Chef Joe Cerniglia (Right, in black uniform) with Chef Thomas Griffiths of the Culinary Institute of America. 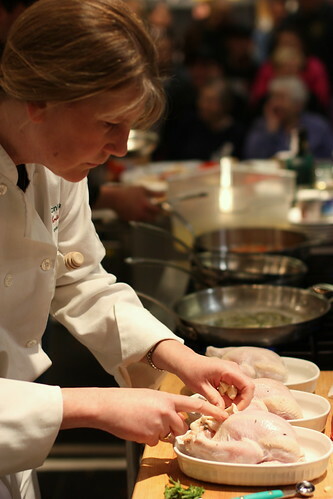 Cerniglia in intense concentration mode. 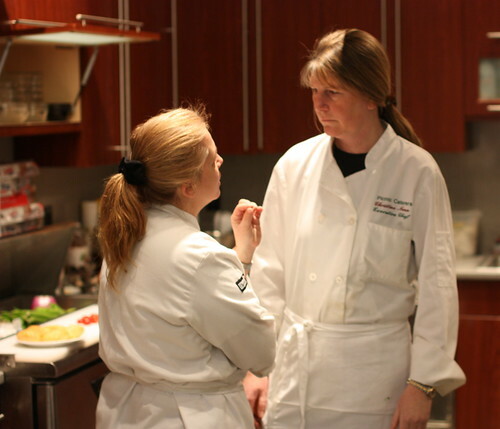 Michelle West and Christine Nunn discuss strategy. 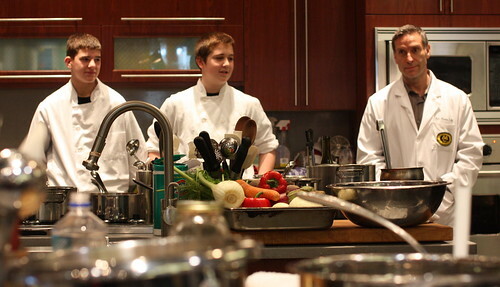 The interns and Certified Master Chef Ken Arnone from the Culinary Institute of America look on. 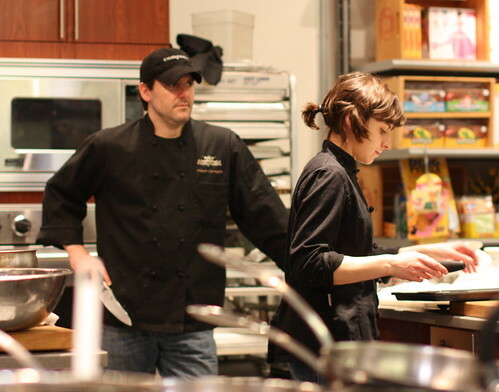 Cerniglia and his Sous Chef/Pastry Chef prepares for battle to start. 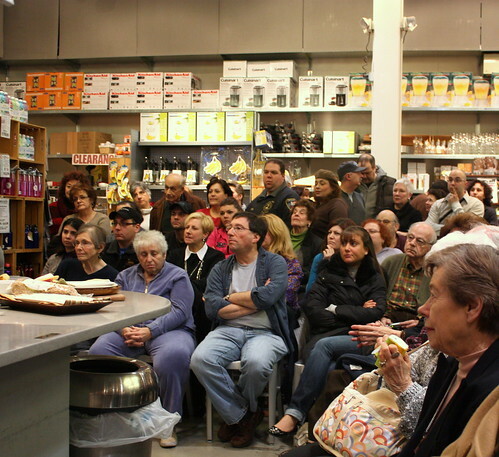 The crowd looks on patiently. Only seconds remaining before the competition starts. 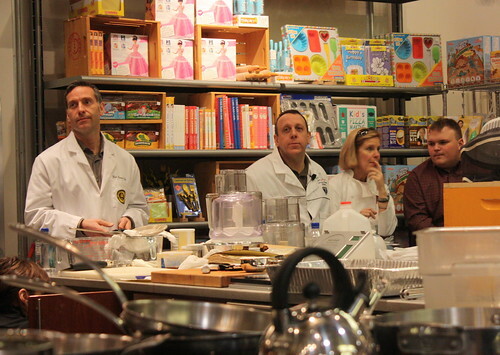 Judges Ken Arnone, Thomas Griffiths, Susan Leigh Sherril (201 Magazine) and Bill Pitcher (Bergen Record) watch with interest. 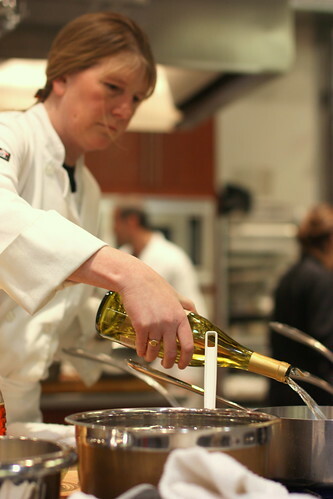 Christine Nunn starts with pouring some Chardonnay in the pot as poaching liquid for her appetizer course. 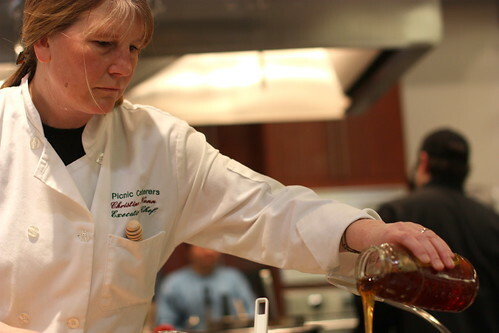 Pouring on the Honey into the pot! 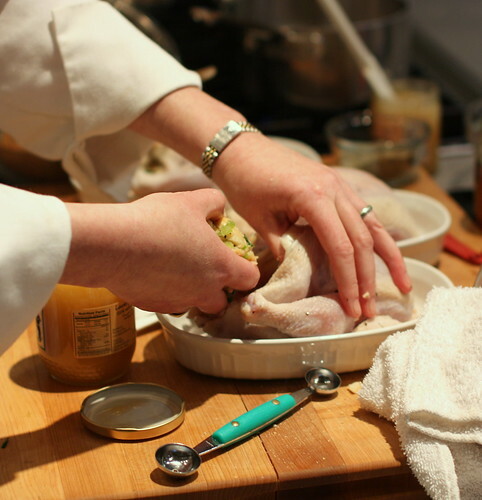 Stuffing the Poussin (Small Chickens) with butter and herbs. 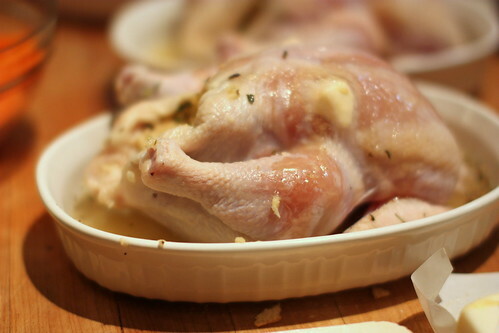 And you can’t have a stuffed chicken without stuffing. And lots of raw honey on top. 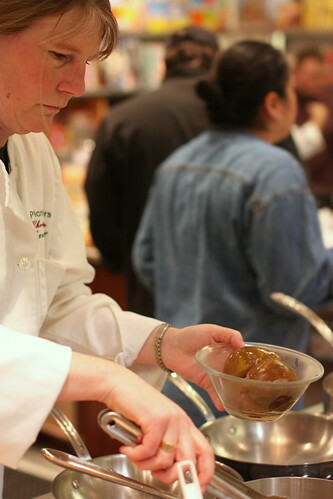 Pulling pears out of the poaching wine. 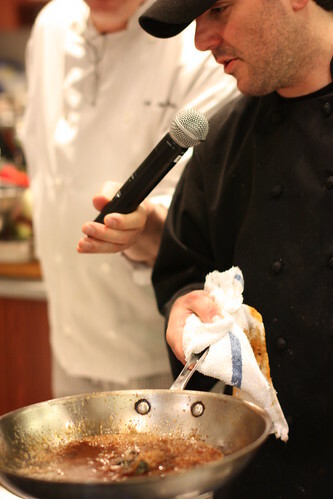 Cerniglia discusses his next course with Chef Central Culinary Director Jim Edwards. 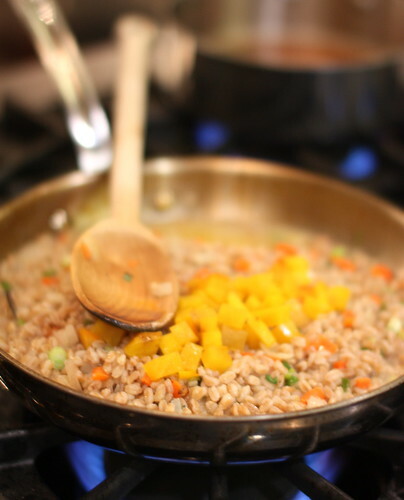 Farro Grain being cooked as a side dish at Cerniglia’s station. 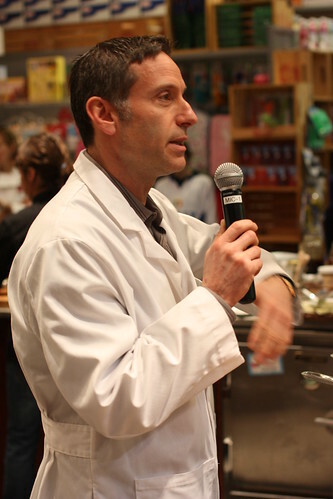 CMC Ken Arnone explains to the audience what is going on and how the dishes are being prepared. 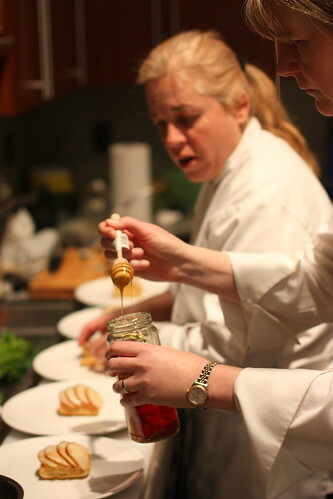 Christine and Michelle work on the pastry/pear base for their first course. 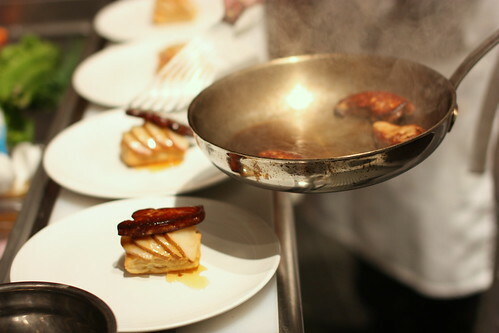 Hudson Valley Foie Gras. 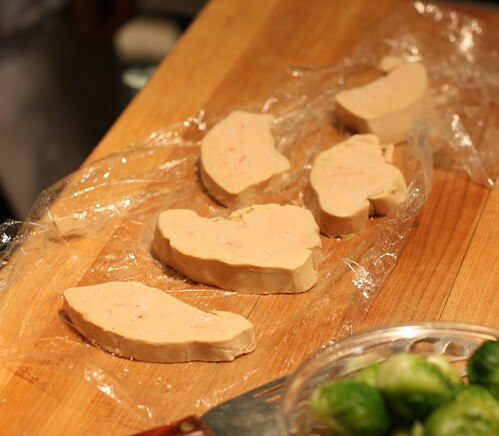 That’s a whole lobe of fattened duck liver. 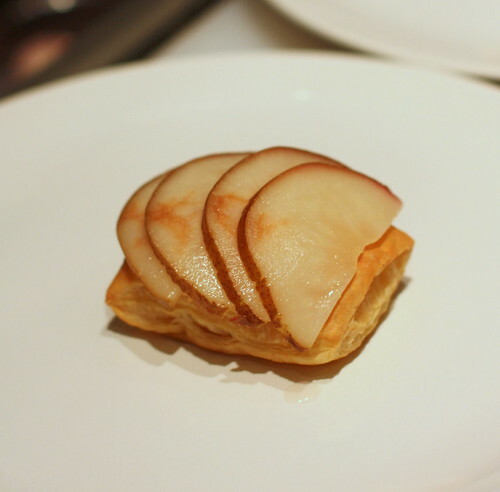 The Foie Gras is seared in a pan and plated over the pears and puff pastry. 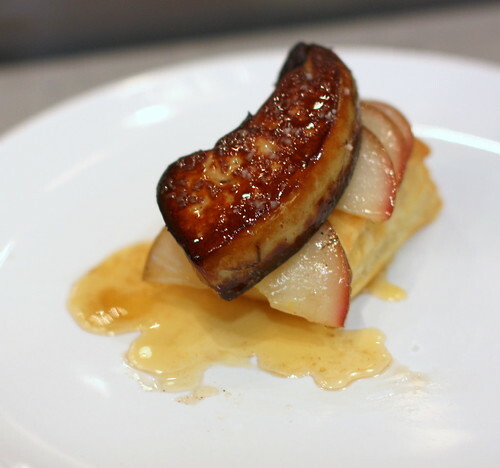 Picnic’s First Course: Seared Hudson valley foie gras with honey and chardonnay poached pears with a puff pastry crouton, drizzle of blueberry honey. 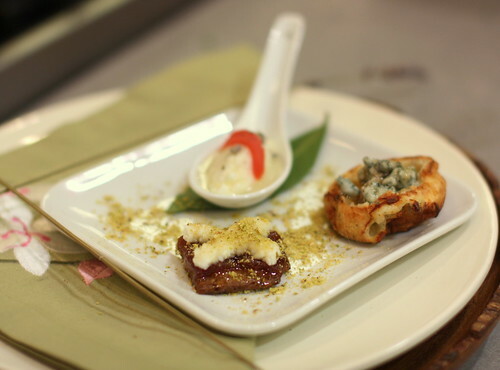 Cerniglia’s First Course: A tasting of three honeys with varied presentations of blue cheese, goat cheese and homemade ricotta. 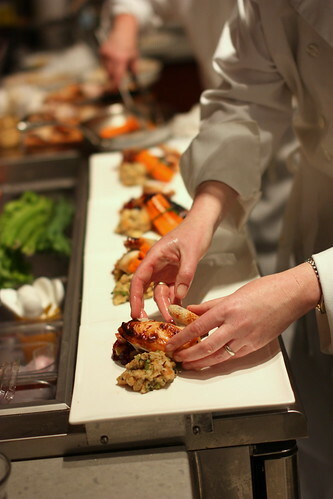 Picnic’s Michelle West works on the plating for the second course. 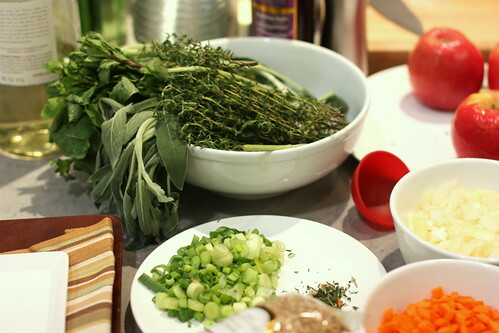 Meticulous down to every green bean. 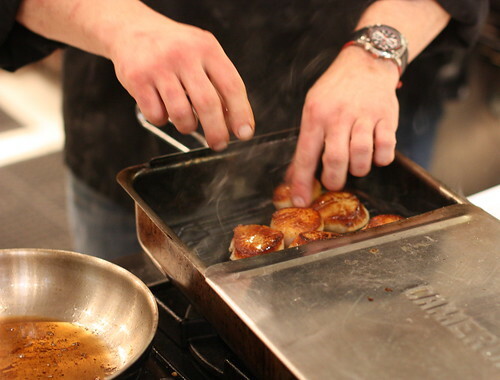 Cerniglia puts honey glazed and sesame crusted pan seared Sea Scallops into a stovetop smoker. Cerniglia’s Scallops ready for his second course. 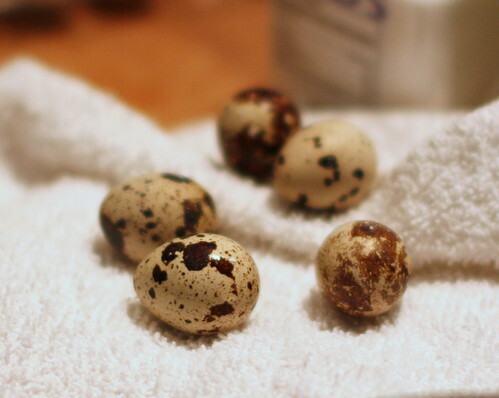 Quail Eggs for Picnic’s second course. 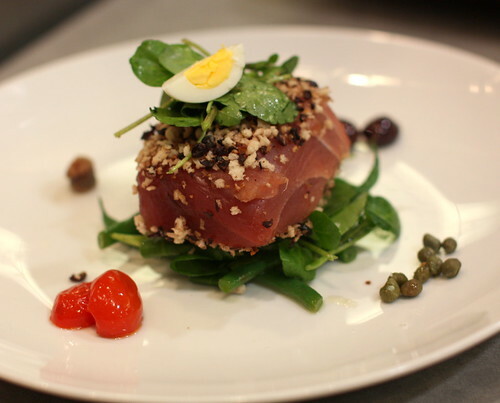 Picnic’s Second Course: Deconstructed Salad Nicoise with Nicoise Olive Crusted Tuna, Haricot Vert, Potato, Quail Egg and Pine Barrens Honey Vinaigrette. 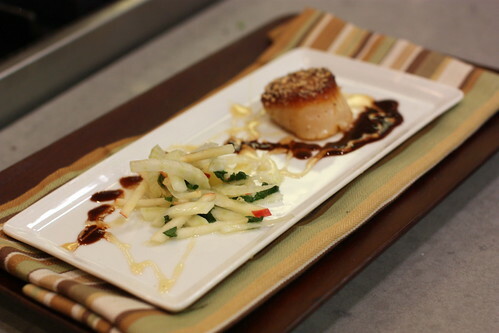 Cerniglia’s second course: Hazelnut Crusted, Pan Seared and Smoked Scallops, paired with Apple, Fennel and Mint Slaw with a Honey Dressing. 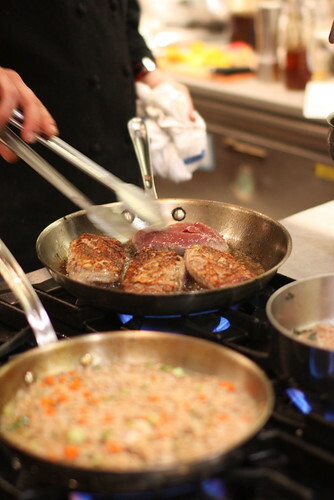 Duck Breasts searing at Cerniglia’s station. 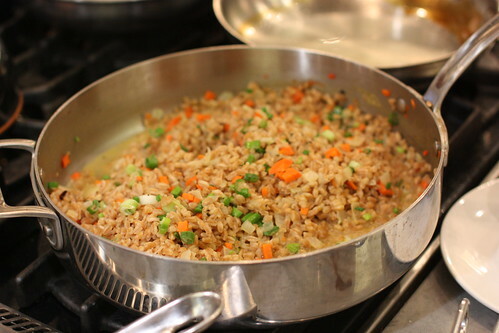 Farro side dish looking good at Cerniglia’s station. 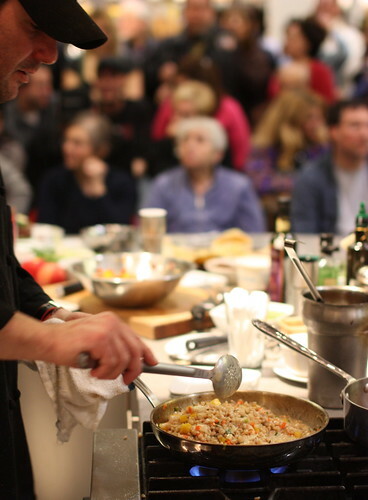 The crowd looks on as Cerniglia finishes off his farro. 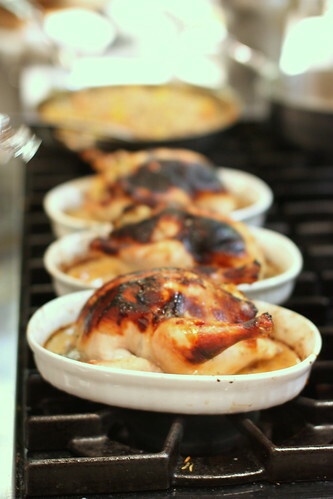 Picnic’s poussin emerges from the oven. 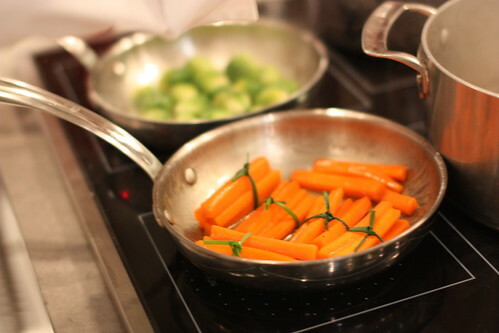 Sauteeing bundles of carrots and Brussels sprouts at Picnic’s station. 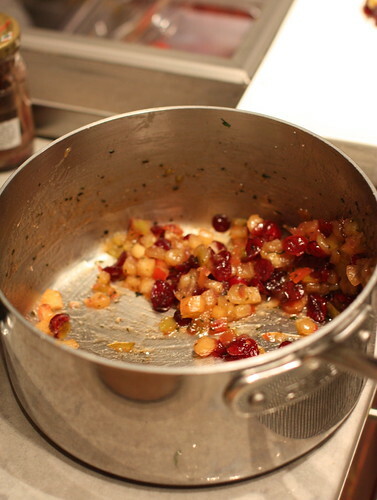 Apple Cranberry Relish at Picnic’ Station. 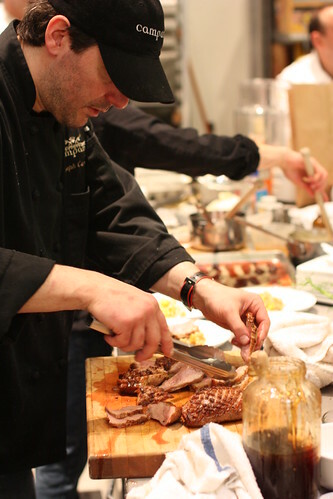 Cerniglia slices up duck breast. 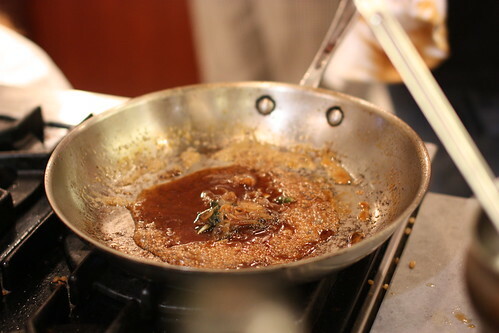 Sauce reduction at Cerniglia’s station. 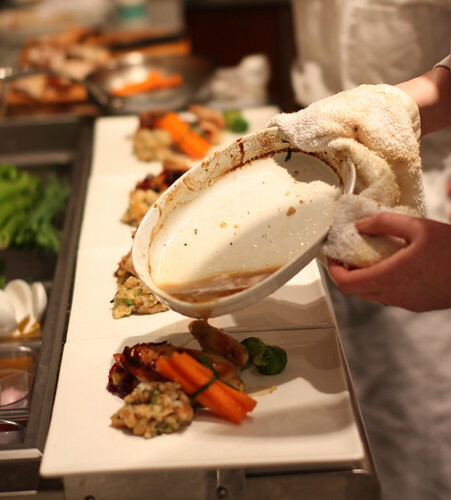 Cerniglia discusses his third dish before final plating. 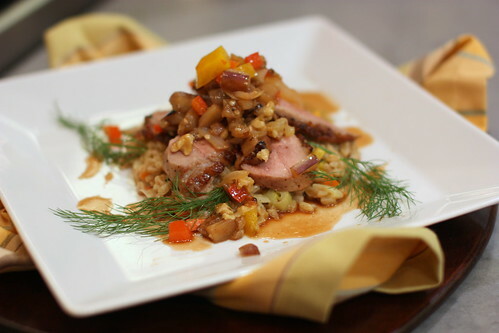 Cerniglia’s third course: Seared Hudson Valley Duck Breast with Savory Farro with Roasted Golden Beets in Honey sauce. 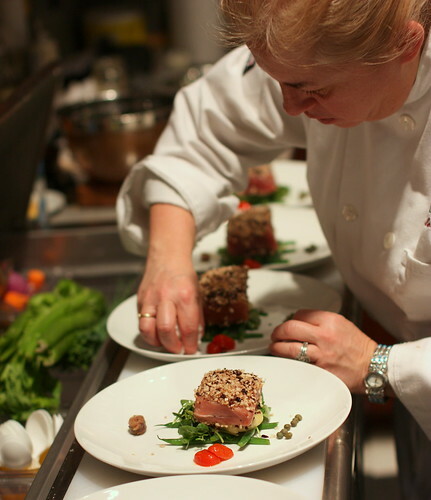 Christine puts the finishing touches on her third course. Can’t forget the Brussel Sprouts. 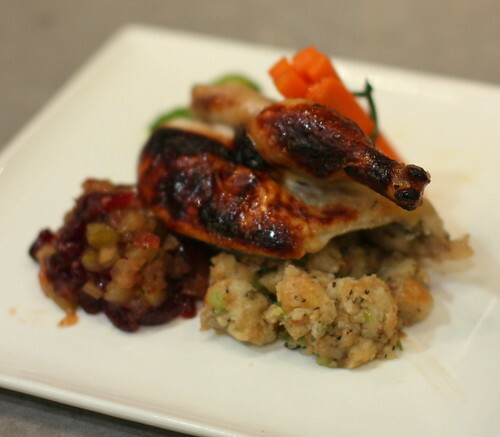 Picnic’s third course: Lavender Honey Glazed Poisson with Baguette Herb de Provence Stuffing, Honey Glazed Carrots, Brussel Sprouts with Apple Cranberry Relish with local cranberry honey. 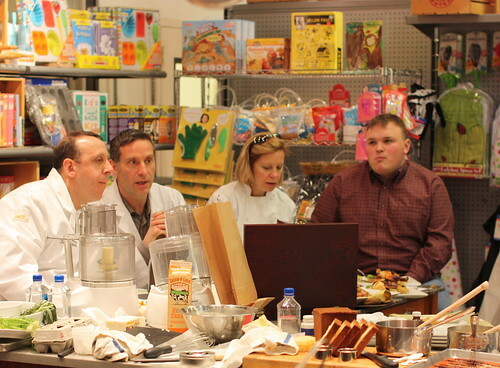 The judges discuss the dishes. 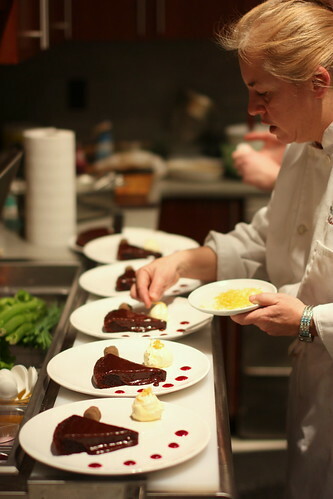 Michelle West works on Picnic’s dessert course. 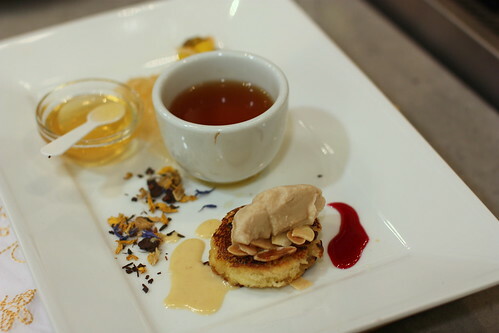 Cerniglia’s dessert course: Pan fried brioched topped with almond sorbet, with honey-sweetened tea. 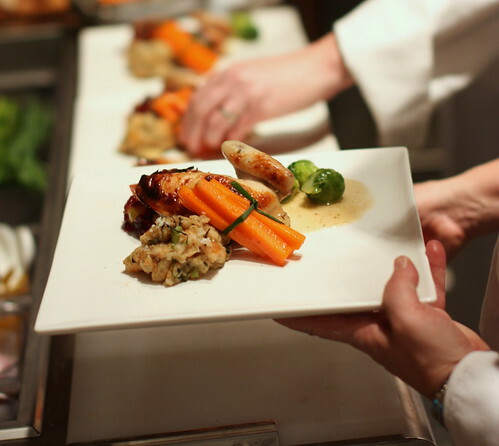 The judges convened for what seemed like an eternity before Chef Central’s Culinary Director Jim Edwards announced the results. 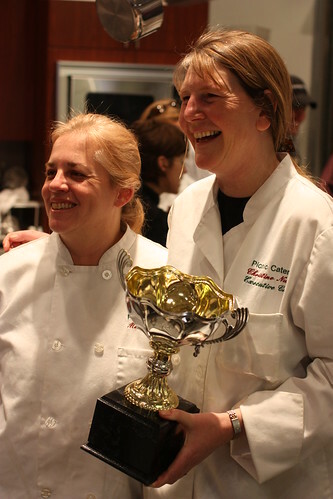 Chef Christine Nunn and Chef Michelle West from Picnic Caterers!!!!! 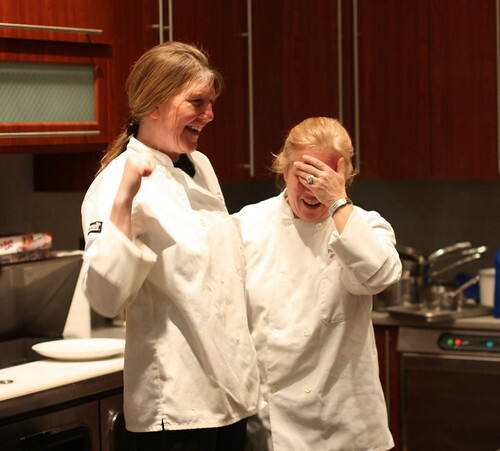 Christine and Michelle will return next year to compete in the 2010 Ultimate Chef final battle. Will Picnic be unseated next year or will they maintain their title? Who knows — but Christine and Michelle deserve a hard-earned rest. 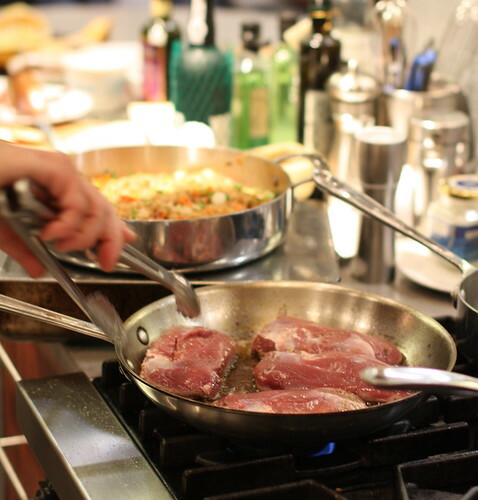 This entry was posted on Sunday, March 1st, 2009 at 4:28 pm and is filed under Food, General, New Jersey. You can follow any responses to this entry through the RSS 2.0 feed. You can leave a response, or trackback from your own site. I’m full right now, but this post is still making my stomach growl. I never knew I could love honey in so many ways. 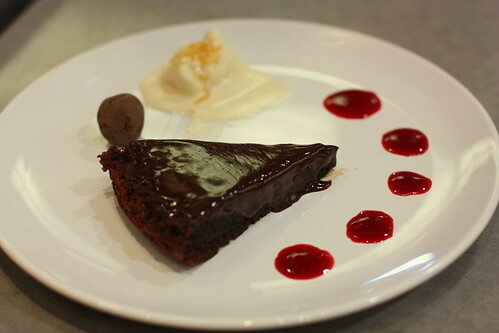 Mouthwatering. Congrats to Christine and Michelle! Christine Nunn deserves this award. 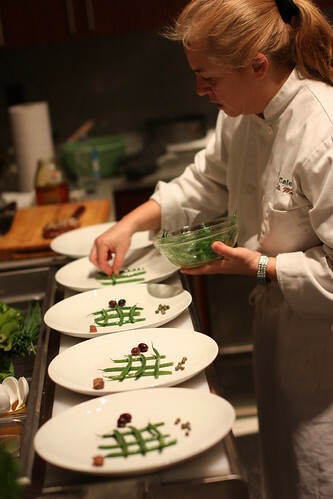 She whips up some great dishes at Picnic and is such a nice person. I always eat well when I stop to pickup a bite to eat there. Congrats to her!!!!!!!! 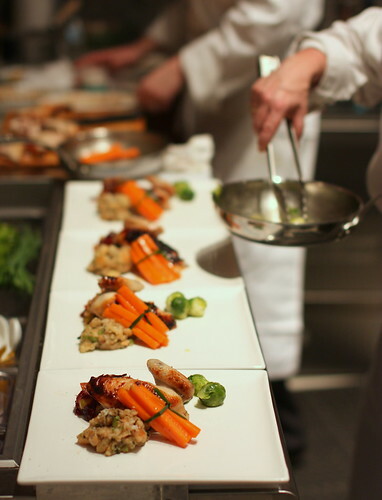 I am salivating over all the epicurian delights. Send it all out to me in a care package. Congrats to Picnic….sometimes its pays to Nitpic! Congratulations to Christine! Her food is so fantastic, and we are very happy for her. We all love Picnic, and wish them the very best! From your friends at the Paramus Public Library. Jason, we are both thrilled with the photos! Great job!